1. To edit your device, click the ‘Edit Device’ icon at the top of the information box. 2. 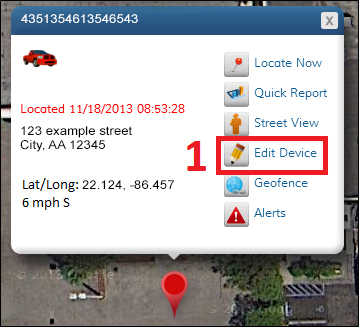 The ‘Edit Device’ window will display your device details such as serial number, activation date, subscription expiration date, and last known location. 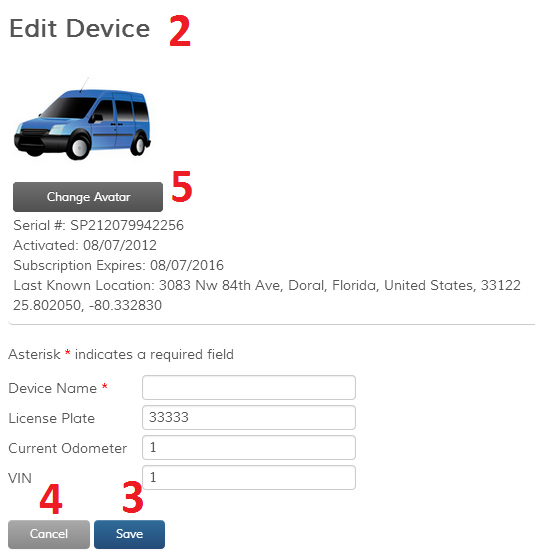 Below your device details are fields you can modify (Device Name, License Plate, Current Odometer, VIN). 3. When you are finished modifying the fields, click the ‘Save’ button. 4. If you would like to cancel your changes, click the ‘Cancel’ button. Note: You may need to scroll down to see these buttons. 5. To change your avatar, click the ‘Change Avatar’ button. You can now select a new avatar from the list, or upload your own. (Please note, your uploaded avatar must be smaller than 2 MB).